2 Comments Published by Jane on Saturday, July 19, 2008 at 12:36 PM. Vernon and Union Hills lay east of Main South, flanking the island to the east, as Main South flanked that district to the west. Though located deep inside the east side, the Vernon and Union Hills were not slums. The steep slopes of the hills had deflected the tide of factories, tenements, and warehouses that had overrun the Island, East Worcester, and most other east side neighborhoods, leaving the hilltops almost exclusively residential in 1900. Indeed, some of the houses built on Vernon Hill in the late nineteenth century, such as George Crompton’s “Mariemont,” rivaled the mansions of Worcester’s west side. Most of the homes on the slopes and summits of Vernon and Union Hills, however, were simple if neat cottages, substantial two-family homes, or sturdy, ample, and almost elegant three-deckers. If the eastern hills were not an exclusively wealthy area, they were, nonetheless, one of the most comfortable places in Worcester to live and certainly one of the most attractive on the east side. The eastern hills thus attracted different types of Irishmen than the Island below or even Main South further west. As in Main South, second-generation Irish men or women headed a large proportion (40.1 percent) of the Hilltops’ Irish families in 1900. Yet while Main South had a largely skilled blue-collar Irish population, the Hilltops seemed to be especially attractive to Worcester’s slowly expanding Irish white-collar class. Over two-fifths of the Irish foreign-stock families on the hills were headed by white-collar workers. Furthermore, an even larger proportion of the Irish on the hills than in Main South lived in one- or two-family homes. As the number of white-collar Irishmen in Worcester increased, the number of Irish families creeping to the top of the eastern hills also rose. In 1900, the Irish made up only 11 percent of the people living on the eastern hills, but the Celtic population there was growing quickly. Between 1880 and 1900 the Irish population on the Hilltops had risen by 332 percent, and in the first few years of the twentieth century some streets and blocks on Vernon and Union Hills became thoroughly Irish. Worcester’s 1904 House Directory, for example, listed an almost unbroken row of Grogans, McHughs, Cahills, and McKennys on Union Avenue from Vernon Street up the slopes of Vernon Hill to Arlington Street. Parts of Mott Street, South Street, and Penn Avenue had also become almost exclusively Irish by that year. What was happening in Worcester in 1880? 0 Comments Published by Jane on Wednesday, April 02, 2008 at 9:00 PM. 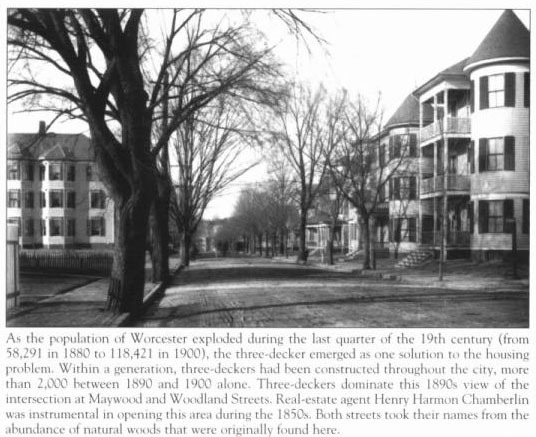 What did the Worcester, MA of 1880 look like for Thomas & Mary McDonough? Why did they choose to settle in this city? I may never be able to fully answer those questions, but the following books provide some clues. Worcester, 1880-1920 provides numerous photos of the Worcester Thomas and Mary were growing their family in. According to the book, Worcester had a population of 58,291 in 1880. By 1900 the city had swelled with a population of 118,421. Worcester (Postcard History) states: At the beginning of the 20th century, Worcester was one of the largest inland industrial cities in the world. The city boasted a diverse manufacturing base that drew immigrants from all over the globe. So this inland city with its numerous jobs likely first attracted young Mary and Thomas. The explosive growth of the city during their prime working years provided opportunities for them to get ahead. It may also have encouraged them to invite other family members to join them in the growing city with plentiful jobs.